So about The 5th Wave by Rick Yancey, haven’t finish it yet. 62% and now is getting exciting although I’m still waiting to get surprised I don’t know if it is that I was measuring all the possibilities while Cassie (main character) was talking/thinking delusional thoughts throughout the whole book or if I am just deductive or maybe Rick wrote it in that way so WE, the readers, would know but Cassie wouldn’t. I had one surprise many chapters ago but the rest I was: Yes, exactly. What else could it have been? I am not saying the book is bad; it’s great actually, I was just pointing those parts out. The worst as usual (lately) is that I have to wait until September 16th 2014, supposedly, to read the 2nd part (*sigh*). Once done with the whole thing, what will become of all those poor readers that must wait until the next one? Over and done. The 5th Wave takes you to this post-apocalyptic place where all you can think of is how would I do things? I guess all post-apocalyptic settings that you read do that for you but this one has a certain hidden quality that really makes you think. The book, the end of the book to be more precise: what on earth Rick Yancey? Are you for real? Not my exact words but close. I’m losing it, Cassie, Sam and Zombie, seriously? Let us leave the end and go back a few chapters, the beginning of the book was a bit a harsh, I do not what it is with some books that have real trouble to actually catch your attention from page one, or is it just me? It has happened to me a lot in the past but after half of it, I continue and cannot stop until the very end, I guess you realise that they are really good or simply the characters grow on you. 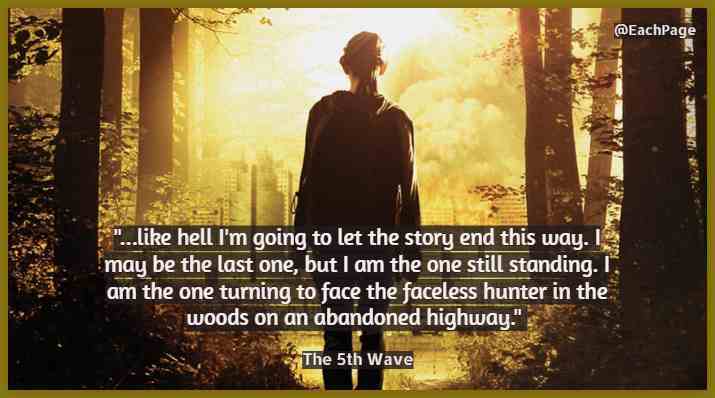 The 5th Wave as far as I am concerned teaches us to be survivals, it is one of the most post-apocalyptic world you can find in written fiction, the main is a teenager as all young adults but she is one that can truly survive out in the wild; she had to learn the really, really hard way. Now the long wait until September. Is going to be a long year. In general context, I liked it of course I wouldn’t even be bothering to write this if I would not have enjoyed Cassie running around thinking she was the last human on earth (only a 16 year-old would think that), me and my fixation with criticizing 16 year-olds, can’t help it. Though I cannot help to be a bit sympathetic to her, now that I think about it, if everyone around you disappeared and you did not find anyone on the road as you walked and walked, then you too would believe to be the last one; even though hope is the last thing that you lose, I can maybe understand that she thought she was truly alone. Sammy was better, I actually felt a little for him. Zombie I’m sorry but he didn’t grow on me, not in the slightest. Cassie did grow on me, the longer I read the better she got and Evan Walker? Is Evan, he is not high on my list of male characters but he is a force to be reckon, I mean you have to eventually like the two main characters, right? If the books is actually interesting than that is a very likely possibility. All in all I liked it, it gives you aliens and conspiracies, kids running around killing, mystery, drama, some jokes here and there; is an enjoyable reading. Yes I recommend it, me and the thousands other fans I am sure it has in the world. If you are a fan of this first book, then do not forget to let me know in the comments or by sharing this short one. If you have already read The Infinite Sea then you can head to that review next. Thank you for sticking to the end, I really appreciate it.